Raro Video is proud to announce the Blu-ray and DVD release of Franco Prosperi's Meet Him and Die a rare gem of the poliziotteschi genre starring Ray Lovelock (Fiddler on the Roof; Live Like a Cop, Die Like a Man), Elke Sommer (Lisa and the Devil, A Shot in the Dark), and Martin Balsam (Psycho, Cape Fear). In this frame by frame, digitally restored, first time Blu-ray release, comes this rare entry into the poliziotteschi genre. A robbery goes terribly wrong for a hapless criminal Massimo (Ray Lovelock) when he tries to break into a jewelry store only to have the steel shutters immediately slam down and lock him inside until the police arrive. Naturally, he is sent straight to jail but it doesn't take long before he befriends a big time crime boss inside, but the plot thickens when it transpires that the young man is actually not who we think he is. NEW YORK, NY- MARCH 3, 2014 - Raro Video is proud to announce the Blu-ray and DVD release of Franco Prosperi's MEET HIM AND DIE, a rare gem of the poliziotteschigenre starring Ray Lovelock (Fiddler on the Roof; Live Like a Cop, Die Like a Man), Elke Sommer (Lisa and the Devil, A Shot in the Dark), and Martin Balsam (Psycho, Cape Fear). Raro Video brings this hard-hitting Italian police thriller to Blu-ray and DVD, digitally remastered, on April 1, 2014. The SRP for the Blu-ray is $34.95, and the SRP for the DVD is $29.95. Bonus features include a video introduction by Mike Malloy (6:34), new and improved English subtitles, and a fully illustrated booklet about the film. In this frame by frame, digitally restored, first time Blu-ray release, comes this rare entry into the poliziotteschi genre. A robbery goes terribly wrong for a hapless criminal Massimo (Ray Lovelock) when he tries to break into a jewelry store only to have the steel shutters immediately slam down and lock him inside until the police arrive. Naturally, he is sent straight to jail but it doesn't take long before he befriends a big time crime boss inside, but the plot thickens when it transpires that the young man is actually not who we think he is. The two execute a successful escape and we soon find out that we don't really know the true background of these criminals or what is really motivating them. Franco Prosperi (Last House on the Beach) directs this revenge themed crime film with Ray Lovelock and Elke Sommer. 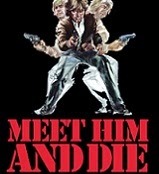 With its clever plot twists, fist fights, motorcycle and car chases, MEET HIM AND DIE is an entertaining police action thriller.